Most people were expecting an iPhone 7S, but instead we got a phone worthy of the name iPhone 8 and Its stablemate the iPhone 8 Plus. Depending on whether there is an iPhone 9 next year, this could be the end of the road for the traditional iPhone with a LCD screen and a circular home button; The future has already arrived in the form of the iPhone X. Either way, this is a major update that should be overshadowed by no other device. 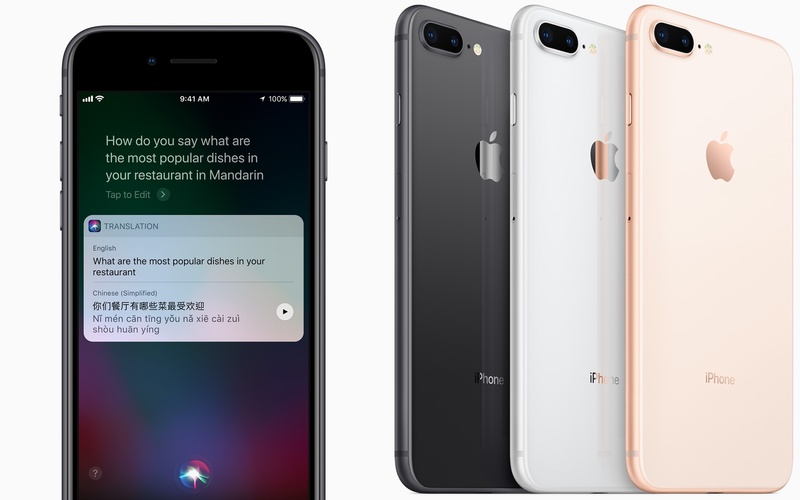 The iPhone 8 and 8 Plus continue the design lineage that started with the iPhone 6-series. They feature the same 4.7″ and 5.5″ screen sizes and have roughly the same dimensions. That doesn’t mean its been 4 years of the same. In fact, the leap from the iPhone 7 to the 8 might be the biggest of them all, especially in the design. The 8 introduces a whole new element to the equation: glass. Not only does Apple claim it to be the most durable glass to see a smartphone, it features a 7-step coloring process to match the aluminum sides. If not for the glossy reflective nature of the glass, you can barely tell where the metal ends and the glass begins. That glass back wasn’t just a design element, it has a reason. The iPhone 7 began the step towards a totally wireless iPhone by cutting the headphone jack. The iPhone 8 takes the next step by adding wireless charging standard Qi. If that name sounds familiar, its the one used by Samsung and most other device makers. Its also the technology used, albeit in a modified form, in the Apple Watch. Since it is a mature ecosystem, that means there are plenty of wireless chargers out there you and buy right now. There is one question question though about Apple’s implementation: how much power can it deliver. In the latest spec of Qi, fast charging can deliver up to 15w. However the two products from Belkin and Mophie Apple mentions support an earlier 7.5 revision. With Apple not providing the version used, we’ll have to find out how fast the iPhone 8 can actually charge. Either way, its more than the 5w provided by the Apple Wall Charger. As customary, the iPhone 8 has a brand new SoC, in this case its the A11 Bionic. Following on from the A10 Fusion which featured 2 High Performance and 2 efficiency cores, the A11 doubles the amount of efficiency cores for a 6-core design. Apple claims a 25% boost for the high performance cores and 70% for the efficiencies. What’s more, all 6-cores can be used in tandem for maximum performance. For the first time, the graphics chip is also an Apple product rather than a PowerVR design. Apple claims The new triple-core chip is 30% more powerful than the graphics on the A10. At first glance there isn’t much difference between the camera specs of the iPhone 8 series compared to the iPhone 7. Specs can be a bit deceiving. The sensors are larger and feature a new image processor. The cameras also offer enhanced video performance for 4K Video at 60FPS and 1080 slow-motion at 240FPS. With the 8 Plus there’s a new Portrait Lighting Effect that uses both the telephoto and wide-angle cameras in combination with the signal processor and AR technology to be able to manipulate lighting and background effects in a portrait. The iPhone 8 and 8 Plus come in three colors and two storage options. The iPhone 8 will come with 64GB for $699 and 256GB for $849. The 8 Plus is $100 more in the same two capacity for $799 and $949 respectively. Both will come in your choice of Space Gray with Black Front, Silver With White Front, and Gold with White Front. If you’re a fan of Rose Gold, Red, Gloss Black or any of the other myriad of color options the iPhone 7s came in, you’re out of luck. The iPhone 8 and 8 Plus Will launch September 22nd on nearly all carriers and for the first time, it looks like the SIM-free unlocked version will be available at launch.